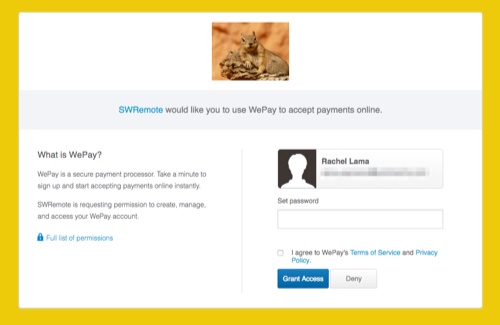 How do I setup WePay with SWRemote? Click the Payments tab. If you do not see the Payments tab on the main menu (below Companies) you will need to reach out to the Support Team to let them know that you plan to setup credit card processing with WePay for SWRemote. Select the correct company name in the dropdown menu - you can have different WePay accounts linked to each of the companies in the dropdown menu. Enter in your First and Last Name along with your Email Address. Preview your User Account information and continue onto Step 2. 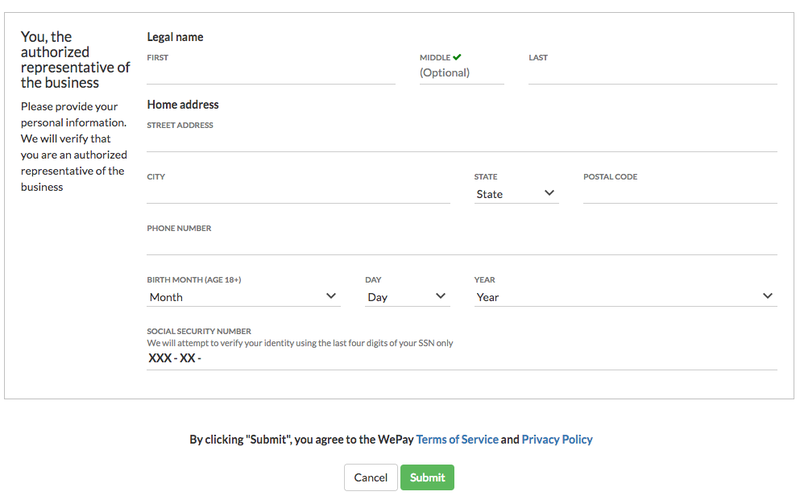 The Account Name is what will appear on your customer's bank statements (you cannot have the words, "WePay" in this field anywhere). The Account Description is just simply another field you can use to distinguish your company (i.e. if you'll be having 2 separate bank accounts for the heating side of your business and your electrical side. You might put in there "John Doe's Services - Heating"). Fill in the remaining company information and click Create WePay Account. 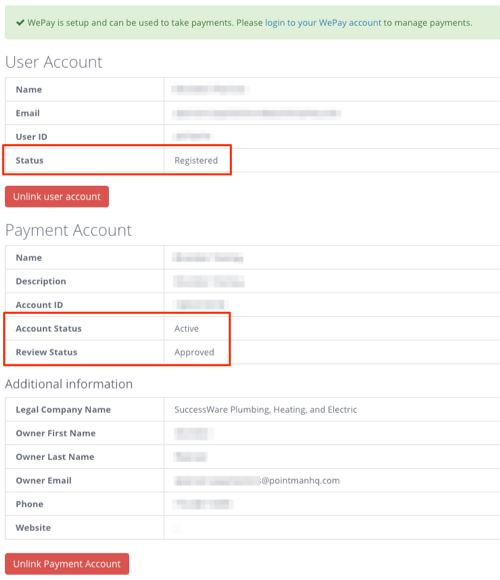 You will be able view your WePay User and Account information and see that the account is still pending. You will then receive an email (to the address that you entered on the initial Payment Processing screen) to set your account password. You will then be brought to a screen where you will enter in your company's information. To see what business information you will need to complete the account setup, click HERE. 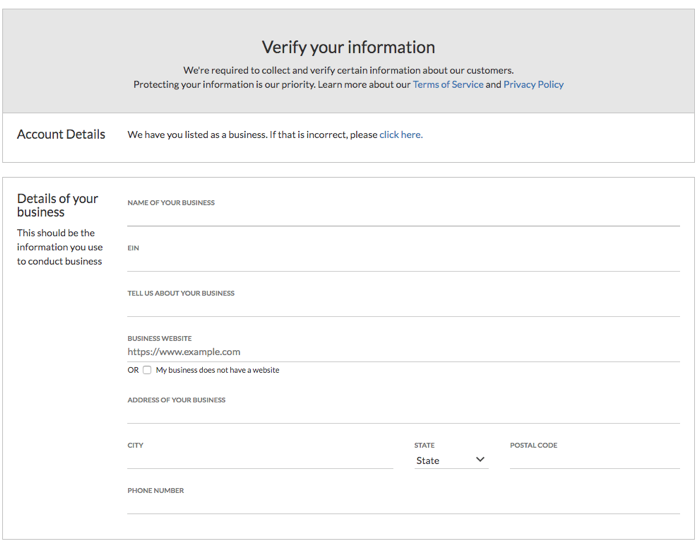 Enter in the details for your business followed by your personal information. WePay requires your personal information to verify that you are an authorized representative of your company. When you're finished, review the information and click Submit. After clicking submit you'll be prompted to enter in your company's bank account information. Fill in the required fields and click Add Bank. After adding your bank account information, the WePay account registration process is complete. 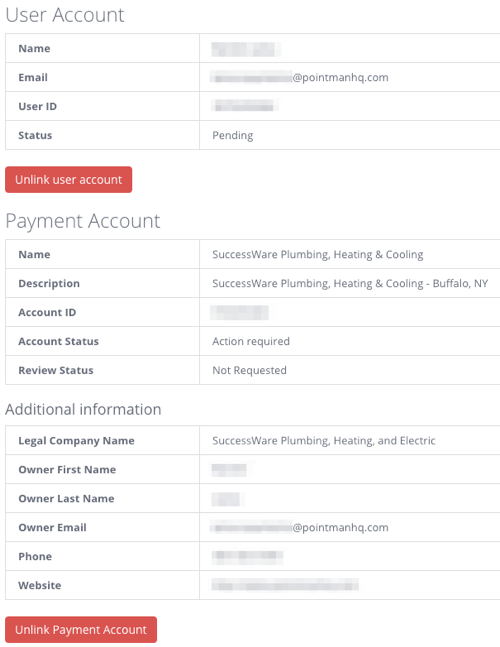 In SWRemote, on the Payments screen you will see that your account is all set. **Next you will need to setup a Payment Method inside of SuccessWare21 to be used in SWRemote. To learn how to setup this Payment Method, CLICK HERE. Once the Payment Method has been created, please login to the SWRemote Admin website, manage.swremote.com, and run an Update to bring this information down. To learn how to do this, CLICK HERE. Finally, the technicians will want to Force Resync through the Settings section of SWRemote on their devices. To see a visual guide on how this can be done, CLICK HERE.